WhatsApp has started rolling out support for QR codes that enable monetary transactions. This feature is currently being enabled for users in the Android beta channel, with a wider rollout expected in the next few weeks. To be able to send money via QR codes, you will have to enable WhatsApp Payments if you haven’t already. With competing digital payments services regularly adding new features to their apps, WhatsApp has seemingly decided to continue to roll out new features for its users too. 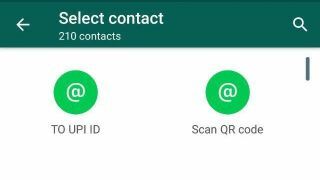 The latest beta version of WhatsApp for Android has added a new feature that lets users send money by scanning QR codes. This comes after the messaging service had recently added a feature called ‘Send to UPI ID’, allowing its users to send money to any UPI ID in India. To enable the QR code feature, you will have to install the latest version of WhatsApp beta for Android, i.e., version 2.18.93. Once installed, you can head over to Settings -> Payments -> New Payment and select QR code. This will open a scanner that will look for a compatible QR code and once the QR code is recognized, you can enter the amount to initiate the payment and authenticate it using your UPI PIN. This feature, along with the ‘Send to UPI ID’ feature, is buried fairly deep in the Settings, making it a little difficult to use in general. In addition to the ‘Send to UPI ID’ and QR code payments features, WhatsApp has added some other features like Advanced GIF Search, which sorts features under Trending, LOL, Love, Sad, Happy and Dancing categories. Apart from GIFs, WhatsApp has also added a Search Stickers functionality. Both these features are currently disabled in the latest beta version and are expected to be enabled in future updates according to some reports.